It was recently decided that the 4th edition Dungeons & Dragons campaign I've been playing in will be switching to 5th edition for our next session. On the whole, I'm excited since 5e feels much more like Dungeons & Dragons should, in my opinion. My stance on 4e has always been that it's a perfectly good system for strategic combat, but it's not D&D. I am , however, disappointed that I won't get to debut my rebuilt warlock who never lets his opponent stand up, ever. With a 5th edition session in the near future and needing to port my character over, I went ahead and picked up the core books as well as the two adventures that have been published so far. I had leafed through a friend's Player's Handbook and determined that I liked the system, so I figure there's a reasonable chance I'll want to run some games in the future. I also figure the adventures will be useful in getting an idea of how the creators of this edition think the game should play. So anyway, I've been reading through those books and in the Monster Manual I found something amazing. The flumph is back. For those not in the know, the flumph is a perennial entry on lists of weird, crazy, or useless D&D monsters (along with such luminaries as the flail snail and the wolf-in-sheep's-clothing). The flumph is one of the rarest of D&D monsters, a lawful good aberration. It's also basically a floating telepathic jellyfish that is helpless when knocked on it's back. Flumphs are awesome. 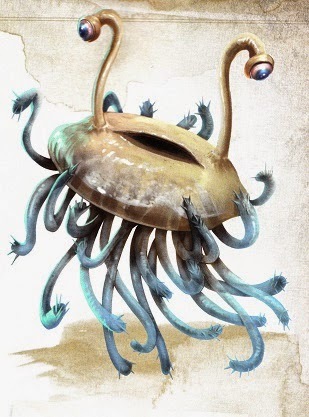 The fact that the flumph is, for the first time, among the initial set of monsters published for an edition of D&D says a lot about the design team's willingness to try and recapture the feel of older editions and marry it with a cleaner ruleset. The Dungeon Master's guide is full of the sorts of random tables that made the first AD&D books so much fun. Example artifacts have DM chosen (or randomly generated) minor benefits and flaws, just like AD&D. One of the example traps is the classic Tomb of Horrors sphere of annihilation trap. Ultimately, D&D is a game about creating stories. A little weirdness and a little randomness can go a long way towards making a story memorable. 5e seems to have been created by folks that realize that, and that brings me great joy. I'm sure the flumphs are happy too.